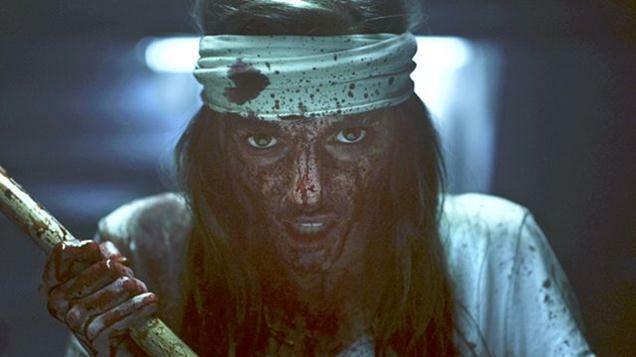 Antisocial is a Canadian-made bloody gory teen horror thriller that’s surprisingly high quality and entertaining. I’ll admit that I didn’t see as many Canadian films as I hoped to see at the VIFF. Antisocial was one I did see. It was the very last movie of the official Film Festival shown: starting at 11:30pm at the Rio Theatre. It proved to be an ambitious work from Canadians at moviemaking, particularily at horror filmmaking. The movie begins with an introduction of two girls filming what appears to be a simple video about clothing only for it be one torturing the other and killing her. Later on New Years Eve a college girl named Sam interacts with her boyfriend through a social website called The Social Redroom. It goes bad as he breaks up with her. That leads her to delete her account. She tries to party it up with her friends to help try to forget the problem. Four of her five friends have active accounts with The Social Redroom. Unknown to them is that an epidemic is spreading outside of them out on just as they’re about to party. The epidemic gets worse and reporters show how this is affecting the world. They even trace it back to The Social Redroom. The founder of The Social Redroom even makes a video of his own warning people of a deadly tumor transmitted to its users. Then Sam and her friends get their first notice when one of their outside friends is a monster infected by this virus. The virus soon spreads throughout the campus. Those of the friends with accounts to The Social Redroom are most at risk. Now the infected are coming after their blood. There is a way to rid one of this virus but it’s to come out of their bodies. So it’s up to Sam and her friends to try to protect each other. They try to look for everything. First the video of the original two girls to trace its origins. Then the warning video of The Social Redroom founder, in which he commits suicide. Then finding information to rid the tumor being transmitted via The Social Redroom. Then Sam to defend herself and then rid herself of the virus. I don’t think the filmmakers intended on giving a negative message about social media sites. Anyone who sees this knows that The Social Redroom is a Facebook-like site. In fact looking at this movie, I feel it’s more of just an attempt at trying to make a teen horror movie. That’s it: nothing more than a teen horror movie meant to scare them for their entertainment pleasure. I will have to say this is a very good effort at putting one together. It features many ingredients that would make for your typical entertaining horror movie. There’s the paranormal, the action happening at a college dorm, and the all-too-common phenomenon of social media and giving everyone all the details. The visual effects, horror make-up and even the climactic moments of horror didn’t come across as too cheesy or amateurish. Even the ending didn’t look bad. It ended on the right ridiculous note. The musical score was also a good addition to the horror story as well. I will admit that it doesn’t have the big-star fuel that Hollywood teen movies have nor does it have the mass marketing given from Hollywood to make it excel at the box office. Oh yeah, it also lacks the shirtless scenes of guys that have been standard ever since the Twilight movies. Nevertheless this is a very entertaining movie that was put together very well and very professionally. I had a hard time trying to find a moment that was very amateurish. I even found it hard to notice a moment from one of the actors that lacked believability. Michelle Mylett was good in what is her first acting role. Also good is Cody Calahan in his first ever direction of a feature-length film as well as co-writing with more experienced writer Chad Archibald. I felt it was kind of like The Ring mixed with 28 Days Later with Night Of The Living Dead mixed in. Okay I’m sure a lot of you are wondering: “What’s a film like this doing in a Film Festival? Film festival films are supposed to take the art of filmmaking to new lengths.” True but not 100% true. The Vancouver Film Festival is an event that showcases filmmaking quality from around the world including Canada but it’s also an opportunity to have films for further distribution. Some films will go on to the big screen for bigger and better things. Some will find their way on DVD, Digital Movie Websites or movie television networks. And then there are some where the VIFF will be the furthest it gets. Antisocial made its debut at Montreal’s Fantasia Film Festival. It continues to make appearances at various film festivals. Good buzz for it can help it get picked up for further distribution. We should remember few English language Canadian-made movies make it to the big screen. Nevertheless I see good potential for this film. We’ll have to see. Antisocial is a teen horror thriller that lacks the star-studded buzz but is excellently put together and goes beyond its modest expectations. All it needs is more film fest buzz to develop a crowd to give it a fair chance. This picture in a J. Crew e-flyer is the subject of major discussion this week. Ever notice how in the news there’s always a story that comes from nowhere and is not worth paying any mind, until some loudmouth makes a hullabaloo about it? It’s funny that while Japan is recovering from a tsunami, earthquake and nuclear meltdown, and Libya is fighting a war to depose a dictator, there’s a minor story that makes a lot of loud news. It happened this week when the picture on the right that was featured in an e-catalog from J.Crew got on a conservative pundit’s nerves to the point he spoke out about it. And it has since drawn a lot of reactions since Tuesday. This is a dramatic example of the way that our culture is being encouraged to abandon all trappings of gender identity—homogenizing males and females when the outcome of such “psychological sterilization” is not known. One thing I like to say is that it’s another example of how people like to raise a big fiasco of just about anything. I’ve seen it from both the left and right side of people raising a big fuss over something simple. It seems like the thing nowadays to be offended about anything. Years ago, people were declaring The Passion Of The Christ to be anti-Semitic when it’s the story of Christ’s crucifixion that has been played out many times in the past including on film. Recently after the movie Mars Needs Moms was released, a gay Youtube personality posted on his Twitter page that it’s very offensive to non-traditional families. And now we have right-wing pundits taking a crack at this ad. Do people enjoy getting offended? Yes, it’s a different parent-child bonding scenario but it’s not worth declaring ‘propaganda’ to turn into an issue for headlines’ sake. I also agree with Alyona: in case you didn’t notice, there’s a load of joy between Jenna and Beckett in that picture. It’s very common for parents to neglect their children in their busy lives so a moment like that should be considered fun.Secondly I don’t think paining a son’s toenails pink makes him gay. His orientation has already formed itself even before he was born. In addition when I brought this story up at work, one of my co-workers mentioned that she painted her nephew’s fingernails and they had a fun time together. Weeks later when she brought up ‘nail polish’, he said “That’s girls stuff.” So what does that tell you? Also I admire J. Crew for not responding to this and dismissing it for the ‘non-issue’ that it is.